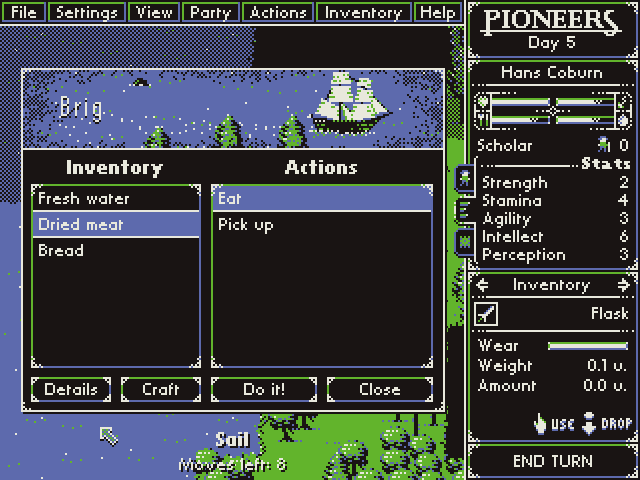 Pioneers is a turn-based exploration/adventure RPG where you lead a party of travellers in search of treasure-rich temples, new tribes and ways to go down in history - ways to go beyond the horizon. To achieve all that you complete quests building up your reputation to become a sought out explorer by kings and commoners alike. You set out promising your father to become someone, to make him proud but not all goes like planned in life, does it? On the way you'll meet many interesting characters, solve challenging puzzles and face all that nature has to offer, be it finding and collecting food and building a shelter to survive harsh winters or facing against a pack of wolves in the densest of forests. The game is currently very much in progress but check below for playable builds. The game uses only 4 colors. Different seasons have different palettes with different set of colors. As to why, read here. For older builds see the game's website. I haven't played the game yet, I'll download it when I got home, but damn this looks GOOD! Wow, that looks indeed pretty cool. Will download and try it later. Tested it for some minutes. Two things that don't look too good. 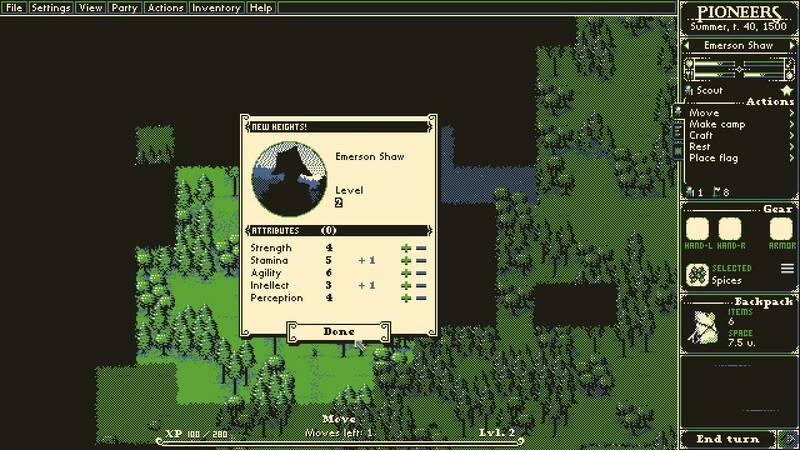 - Your character already knows if he can pass something or not while the area is still unexplored. If there is a forest (on a black area) it just won't move. I'd suggest moving it either till you see the forest your you're standing in front of it. - You can move without using your available steps or energy by simply building a small camp directly onto your character, entering it, and leaving it again putting your character right next to it. Building the camps doesn't seem to cost anything (not even energy). 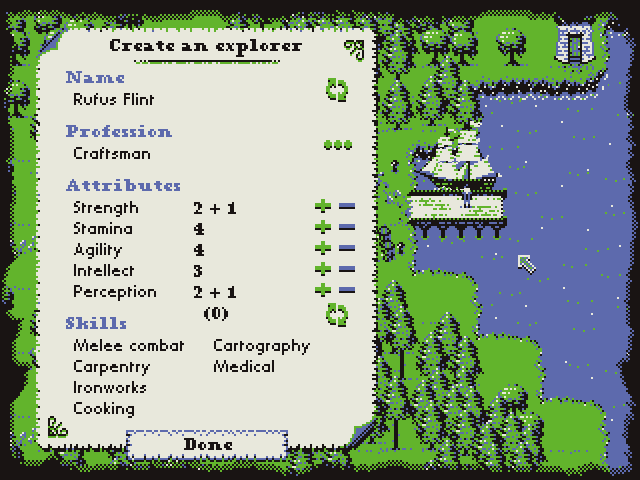 Doing so you can basically explore everything on the day you arrived on the island, just prepare for building lots of those darn camps. I don't need to say that all I did was moving around, so if there's anything else to do in this stage, I didn't see it. Hope this helps. Yes, makes sense. I've been meaning to add that simple check to the pathfinder but never got around to it. Fixing as soon as possible. In fact, there is nothing else to do. 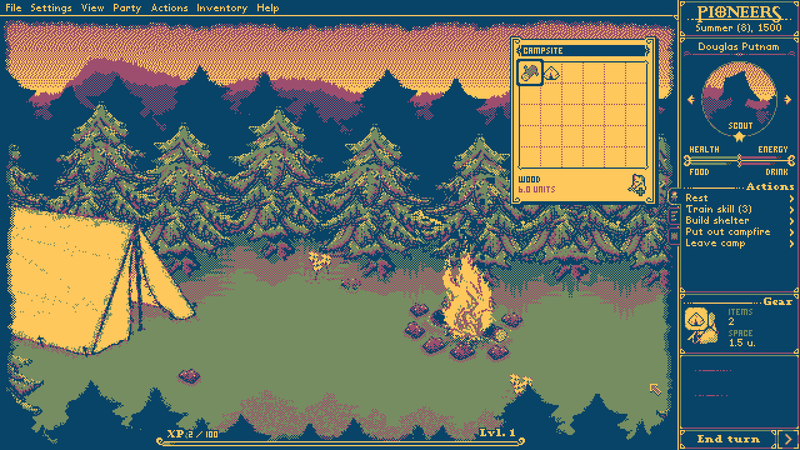 As I said, this is just a tech-demo but I felt like releasing it, because I wanted to see if people like the interface (eg. how actions are given) and the ways things are done overall. I will be making more game content from now on. I'd suggest moving it either till you see the forest your you're standing in front of it. I'd suggest moving it either till you see the forest or you're standing in front of it. I shall bring you some great news! There is no wildlife or any tribes to encounter, just you and the vast landscapes. Looking forward to any comments, questions, critique and so on. Things are still going strong. 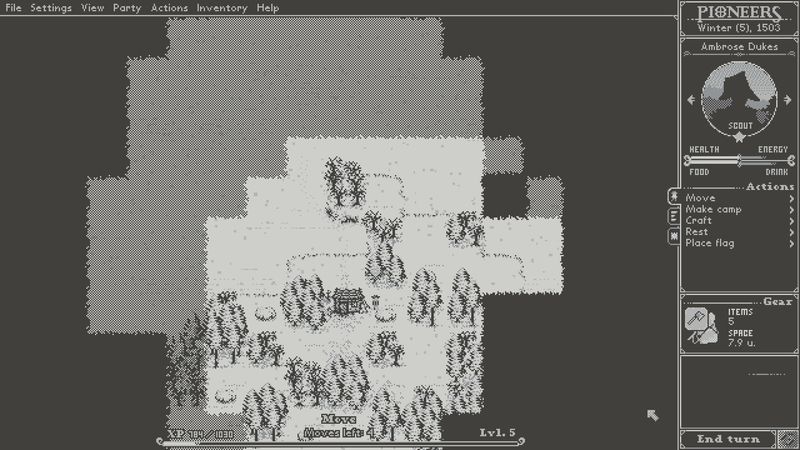 I've been working on the town where the game begins and where you can go back between expeditions. You can find men to hire from the tavern, buy stuff you need from the supply store, get quests and so on. 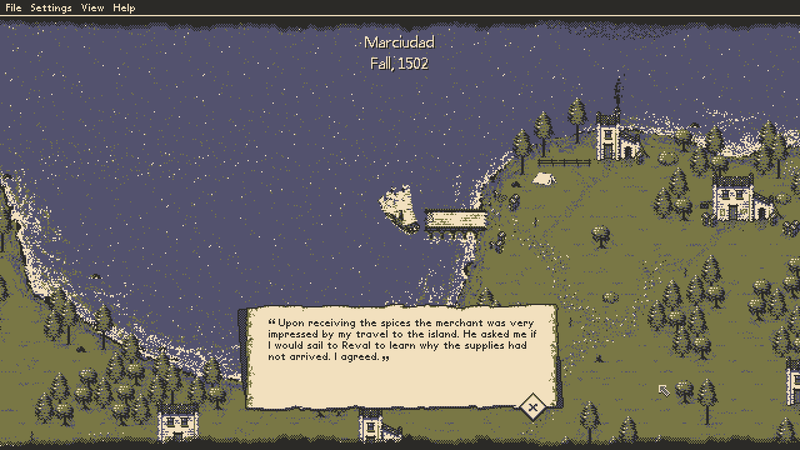 I had drawn the tavern previously, but yesterday I drew the supply store you can see in the screenshot below. I also did the sidebar but the buttons need some work. And a quest button needs adding. 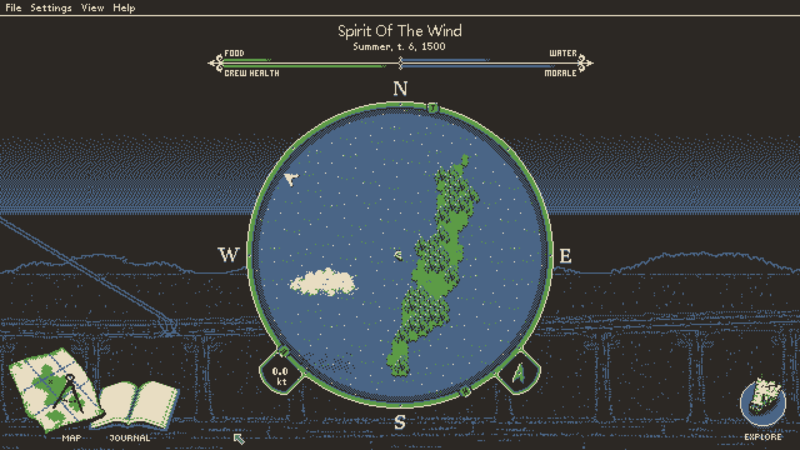 From the map you will be able to choose an area of the world where you want to go. The world will consist of something like 10-15 'levels' which are different in size and terrain type, so the random map generator still applies. 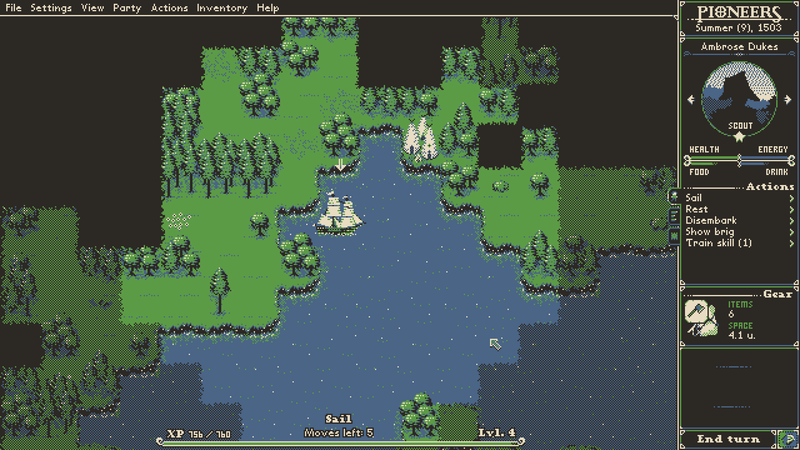 The further away areas are larger and take longer to get there for which you need more men, ships and supplies which means you have to adventure trough the smaller areas to get some wealth before. The travel time will be measured in seasons. When you sail out during spring, you will reach the nearest areas by summer. Or by next spring if it's far away. That forces you to think when and where to go. You can advance seasons by boozing around in the tavern but that will cost you. 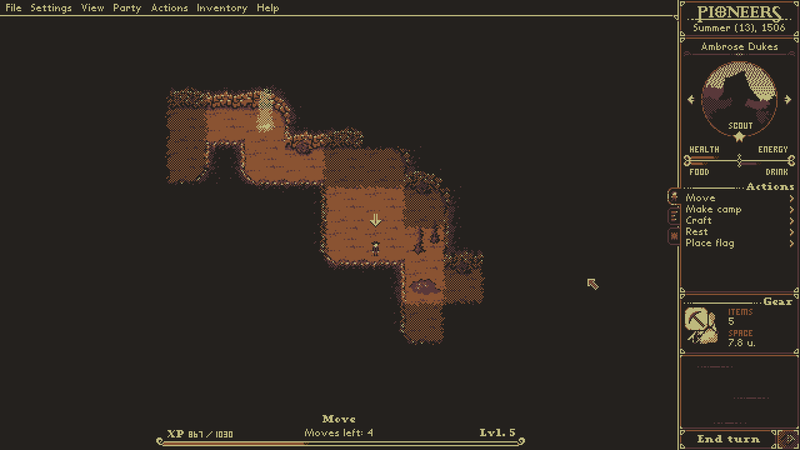 It's all starting to come together and when I squint my brain it's almost starting to look like a game. Really exciting! I'd also like to remind you all that the game can be found on the IndieDB site and if you're a user there, make sure you click 'Track this game' button because that way you are always up to date with screenshots, videos, music and new builds. I've gotten some pretty decent feedback there and the news of the release of the last build was featured on the main page for a while. P.S. - I'm still very much in love with SFML. If one day I get the game done, I'm thinking of separating and cleaning up the 'engine' part of the game and release that separately. Maybe it would be useful to someone. This is absolutely gorgeous! You've got some pixel skillz for sure. Are you writing this using a pre-existing framework/recycling or all from scratch? Thank you! I'm still learning all this pixel madness. It's all done from scratch (including GUI) but I'm planning to keep using SFML so I'm making it so I'd have a solid foundation for the future. Your art is really cool, I love the look of the tavern. 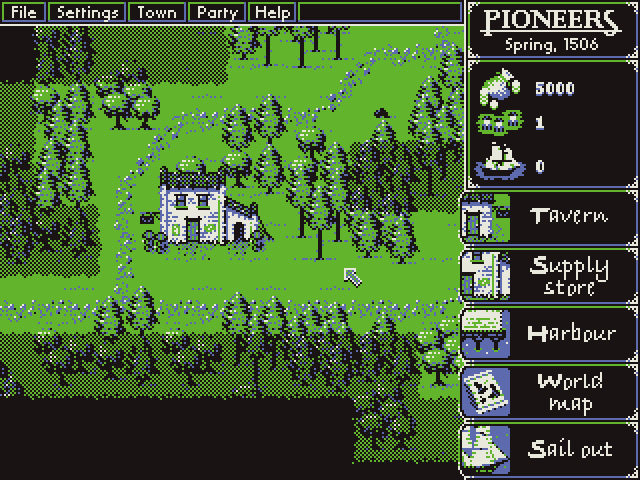 I like the idea of limiting the game to 4 colours as well, it's forced you to develop a really iconic art style! This game looks like it'll be pretty fun too. Also, since you're on indieDB anyway, why not list the engine as SFML? Yes, SFML draws all the graphics on screen and plays all the sounds but everything else from that layer up is my own. So in that sense, the engine is custom. If you would simply use OpenGL (or SDL), would you list that as the engine?. Don't worry, SFML is mentioned in the about screen in the game and always will be. Does indieDB support listing multiple engines? 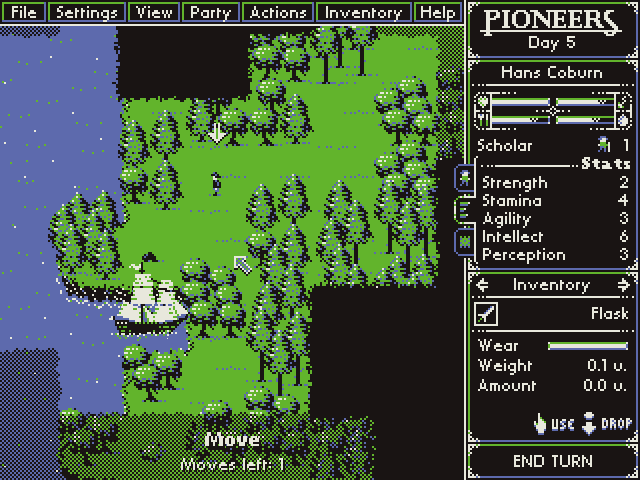 I was thinking it'd be good, since then Pioneers would appear on the SFML page as well(as a game using SFML). It'd be cool if the site supported derivatives but oh well, I changed the engine to SFML. Going to check out what good stuff is there. A new build for your downloading pleasure is probably coming later today, or perhaps tomorrow. Stay tuned! I also updated the first post with latest screenshots and stuff. The art style is just wow, the music is sweet, and if this game becomes half as good as its promise, I can see myself spending countless hours on it. Hours that I could be spending programming, so please stop now! Seriously though, I am very impressed. If you release a new version soon, I'll give it another try, and then give you some feedback if I have anything to say. Do you have any plans to make money on the game?